The Pope vowed to silently walk with the trials of the survivors. “Some of you lost families. All I can do is keep silence. And I walk with you all in my silent heart.” The Pope also assured the pilgrims that Jesus will understand the sentiments of the survivors because He also experienced so much pains. “You might say I have lost my house, my family, but Jesus nailed Himself there to the cross. 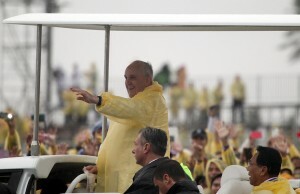 He experienced all [the] calamities we experienced,” the Pope said, explaining that Jesus never “let us down.” “He understands us because he underwent all [the] trials that you have experienced,” he said. “That is why we have a Lord who is capable of crying with us, capable of walking with us in the most difficult moments of life,” the Pope added.